Atherosclerosis is the condition in which the arteries become hardened, preventing a healthy flow of oxygenated blood. This process is common in aging, as plaques can build up causing arteries to become stiff. Plaque buildup also makes the arteries narrow, this way limiting the blood flow as well. Atherosclerosis is a dangerous condition because it increases the risk of a heart attack, stroke, and peripheral artery disease. Although arthrosclerosis is often associated with age, it actually occurs much earlier than you may think. This condition can begin as early as your 20s, and by 30s these changes start surfacing. Although routine checks may come back normal, after the age of 40 issues like cholesterol become evident. For men, signs of atherosclerosis can be seen as early as the age of 45, and for women, it’s around the age of 55. 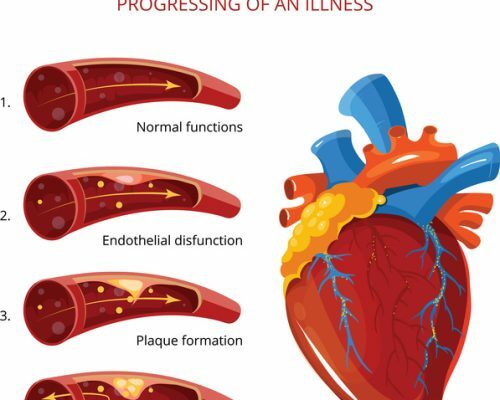 Let’s take a look at some preventative measures you can take in order to reduce your risk of atherosclerosis and the associated complications. The main culprit behind atherosclerosis is plaque buildup, which is a result of cholesterol. Hence, it is important that you eat foods that are not only healthy but help lower your LDL cholesterol and boost HDL cholesterol. A heart healthy diet includes low fat dairy products, fresh fruits and vegetables, skinless poultry and fish, and non-tropical vegetable oils. Atherosclerosis foods to avoid include saturated fats, trans fats, sodium, and red meats, as well as sweets and sugar-sweetened beverages. A study published in the American College of Sports Medicine found that regular physical activity of large muscle groups such as those involved walking, running, or swimming, can reduce symptoms associated with coronary artery disease, which can result from atherosclerosis. Regular exercise is well documented to help reduce cholesterol, maintain a healthy weight, and reduce your risk of other conditions such as diabetes that can contribute to atherosclerosis. The study found that regular physical activity was associated with a reduction of many risk factors contributing to atherosclerosis. The study was a meta-analysis of 52 training trials involving of 4,700 participants over the course of 12 weeks. HDL cholesterol was found to improve and LDL cholesterol was reduced. The studies also revealed a reduction in blood pressure as a result of regular exercise, along with a reduction in insulin resistance. As you can see, it is not only important to eat a healthy diet in order to reduce the risk factors associated with atherosclerosis, but combining it with regular physical activity can help support healthy arteries and maintain overall good health. There are three main types of treatment options when it comes to atherosclerosis: lifestyle changes, medication, and surgery. Because many lifestyle habits contribute to hardening of the arteries, addressing these can help improve the condition. This involves eating healthy, reducing sodium and saturated and trans fats in your diet, not smoking, and exercising regularly. Prescribed medication works to lower blood pressure and cholesterol, and even prevent blood clots (known as antiplatelets). Lastly, surgery can be used to open up and widen the arteries in order to address the blockage. By controlling these risk factors, you can better reduce your risk of atherosclerosis or even reduce your risk of the associated complications. Depending on your risk factors and current condition, your doctor will recommend the best treatment, which will often combine lifestyle factors with medical intervention.